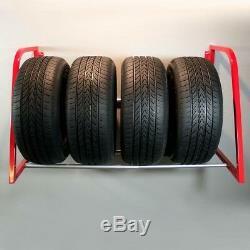 Garage Rack Storage Wall Mount Tire Steel Heavy Duty Shelf Rust Proof Durable. W Adjustable TireLoft is the ultimate tire storage solution, combining durability with flexibility. Installation is quick and simple - 2 steel end frames attach directly to wall studs on finished or unfinished walls, and support shelf tubes attach to the end frames. The TireLoft's unique design allows it to be adjusted from widths of 36 in. Perfect for storing seasonal tires, RV tires, race tires, and ATV tires, the TireLoft will easily accommodate up to 4 standard vehicle tires. Made entirely of strong, durable steel with a red powder coat finish and chrome support tubes. Holds up to 375 lbs. 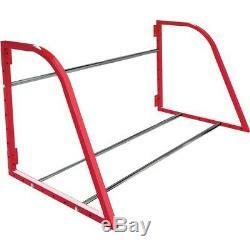 All steel construction with scratch-resistant red powder coat finish. 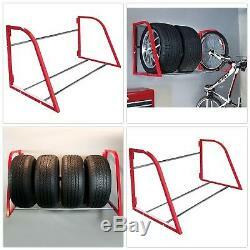 Ideal for storing seasonal tires, RV tires, ATV tires, and more. TireLoft can be adjusted from widths of 36 in. Width: 0 x height: 0 x length: 0 x weight: 0. Garage Rack Storage Wall Mount Tire Steel Heavy Duty Shelf Rust Proof Durable 48 in. 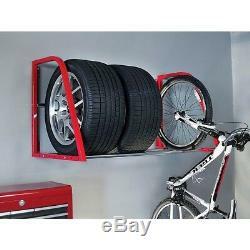 W Adjustable Garage Wall Tire Rack in Red The HyLoft 48 in. Hardware includedAll steel construction with scratch-resistant red p. Our stock all ships from our US-based warehouses. We stand behind our products. We do our best to process as quickly as possible. Most orders are in transit for two days but some may take longer. The item "Garage Rack Storage Wall Mount Tire Steel Heavy Duty Shelf Rust Proof Durable" is in sale since Monday, August 27, 2018. This item is in the category "Home & Garden\Household Supplies & Cleaning\Home Organization\Other Home Organization". The seller is "the_daily_deals" and is located in Phoenix, AZ. This item can be shipped to United States, Canada, United Kingdom, Denmark, Romania, Slovakia, Bulgaria, Czech republic, Finland, Hungary, Latvia, Lithuania, Malta, Estonia, Australia, Greece, Portugal, Cyprus, Slovenia, Japan, China, Sweden, South Korea, Indonesia, Taiwan, South africa, Thailand, Belgium, France, Hong Kong, Ireland, Netherlands, Poland, Spain, Italy, Germany, Austria, Bahamas, Israel, Mexico, New Zealand, Philippines, Singapore, Switzerland, Norway, Saudi arabia, Ukraine, United arab emirates, Qatar, Kuwait, Bahrain, Croatia, Malaysia, Brazil, Chile, Colombia, Costa rica, Dominican republic, Panama, Trinidad and tobago, Guatemala, El salvador, Honduras, Jamaica, Viet nam, Uruguay, Antigua and barbuda, Belize, Grenada, Ecuador, Iceland, Cayman islands, Sri lanka, Luxembourg, Oman, Peru, Paraguay.